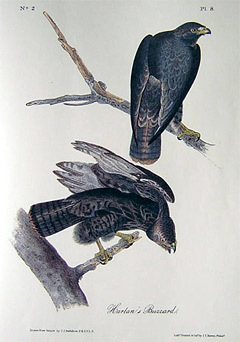 Pictured (right) is John J Audubon’s illustration of the Harlan’s Buzzard. This hand-colored lithograph is Plate #8 from the Octavo Edition of Birds of America – created from 1840 to 1844. “Long before I discovered this fine Hawk, I was anxious to have an opportunity of honouring some new species of the feathered tribe with the name of my excellent friend Dr. RICHARD HARLAN of Philadelphia. This I might have done sooner, had I not waited until a species should occur, which in its size and importance should bear some proportion to my gratitude toward that learned and accomplished friend. The Hawks now before you were discovered near St. Francisville, in Louisiana, during my late sojourn in that State, and had bred in the neighbourhood of the place where I procured them, for two seasons, although they had always eluded my search, until, at last, as I was crossing a large cotton field, one afternoon, I saw the female represented in the Plate standing perched on the top of a high belted tree in an erect and commanding attitude. It looked so like the Black Hawk (Falco niger) of WILSON, that I apprehended what I had heard respecting it might prove incorrect. I approached it, however, when, as if it suspected my evil intentions, it flew off, but after at first sailing as if with the view of escaping from me, passed over my head, when I shot at it, and brought it winged to the ground. No sooner had I inspected its eye, its bill, and particularly its naked legs, than I felt assured that it was, as has been represented by those persons who had spoken to me of its exploits, a new species. I drew it whilst alive; but my intentions of preserving it and carrying it to England as a present to the Zoological Society were frustrated by its refusing food. It died in a few days, when I preserved its skin, which, along with those of other rare birds, I have since given to the British Museum, through my friend J. G. CHILDREN, Esq. of that institution. The Black Warrior has been seen to pounce on a fowl, kill it almost instantly, and afterwards drag it along the ground for several hundred yards, when it would conceal it, and return to feed upon it in security. It was not observed to fall on Hares or Squirrels, but at all times evinced a marked preference for common Poultry, Partridges, and the smaller species of Wild Duck. I was told that the young birds appeared to be of a leaden-gray colour at a distance, but at the approach of winter became as dark as the parents. None of them were to be seen at the time when I procured the latter. Of its nest or eggs nothing is yet known. My friends Messrs. JOHNSON and CARPENTER frequently spoke of this Hawk to me immediately after my return to Louisiana from Europe, which took place in November 1829. FALCO HARLANI, Aud. Birds of America, pl. 136. Plumage compact, feathers of the head and neck short and rounded, tibial feathers elongated and loose at the tips. Wings long; first quill short, fourth longest, third and fifth equal, the first primaries cut out on the inner web towards the end. Tail longish, ample, of twelve broad, rounded feathers. Bill light blue, black towards the end; cere and angles of the mouth yellowish-green. Iris light yellowish-brown. Feet dull greenish-yellow, claws black. The general colour of the plumage is deep chocolate-brown, the under parts lighter, the feathers there being margined with light brown. Tail lighter than the back, and rather narrowly barred with brownish-black, the tips brownish-red. Under wing-coverts whitish, spotted with deep brown.